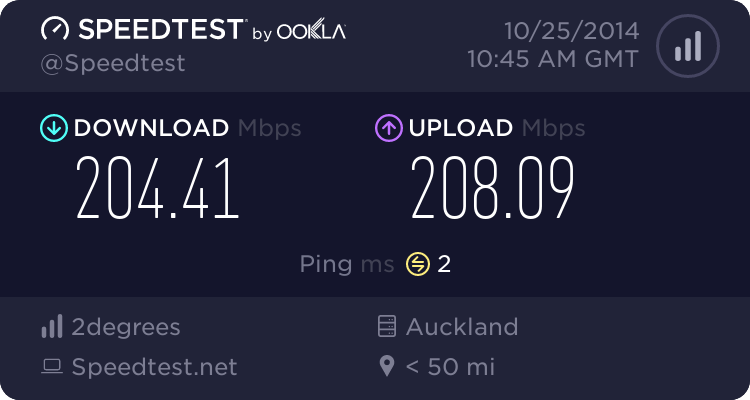 Just wanted to give some good feedback after a migration from Vodafone ADSL to snap. It unfortunately didn't go well but that was due to Chorus stuffing up the port but Snap was quick to get hold of and were responsive. Nice not to deal with 40 min on hold with Vodafone any more as well as script happy level 1 support staff. Something I didn't expect was a significant improvement in performance. Ping times are down from a low of 35ms to a low of 11ms with averages now around 15ms. Some of the laggy web sites that I used to have are now gone as well. Snap don't run cache servers and have better routing. So that will be where you are getting your improved ping times from. When I moved from Compass to SNAP, my line speed was the same but my downloads were 25% faster. Love SNAP, won't move in a hurry, hopefully 2Degreess does not stuff a good thing up. Aredwood: Snap don't run cache servers and have better routing. So that will be where you are getting your improved ping times from. snap also tend to also assign interleavings off by default on adsl.